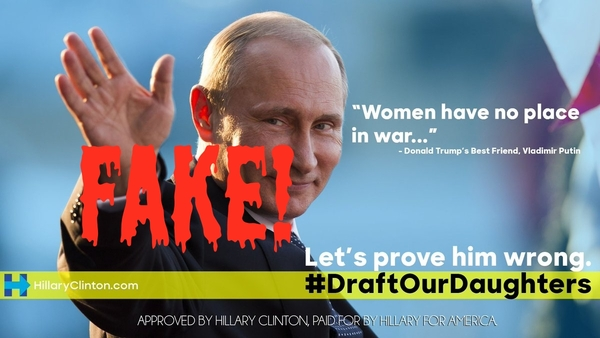 So the Alt-Right and its fellow travelers have a brilliant new strategy to defeat Hillary Clinton — a hashtag (and assorted hashtag-related memes) intended to trick voters, especially women, into thinking that Hillary intends to draft women for an inevitable war with Russia. 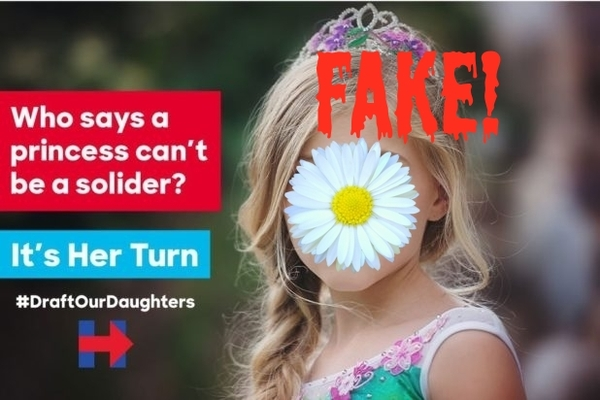 The #DraftOurDaughters campaign could be the thing that brings down the Hillary campaign. … Up until now, women have been able to support leftist social policy because it did not impact them negatively. If they become aware that Hillary intends to draft them into combat to fight a war with Russia, they may re-think the wisdom of their equalist position. Yeah, I don’t think so. Somehow I don’t think the women of America are going to be swayed by any of this. Even aside from the racism, are there really a lot of women out there who think that, of the two major party candidates, Hillary is the one who’d be starting wars? 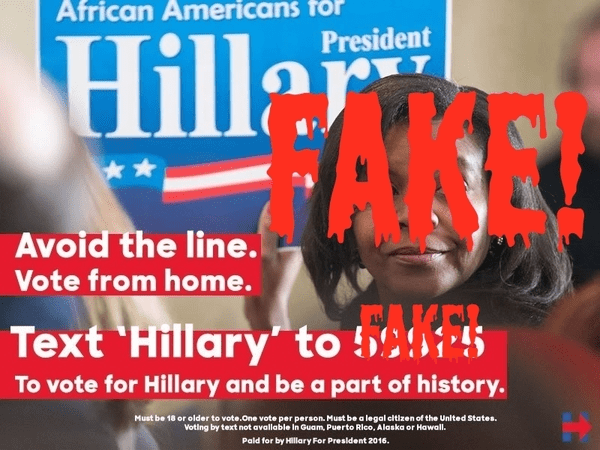 The folks at the Daily Stormer, lovely people that they are, are also trying to convince Hillary voters they can vote via text from their phones, or by posting messages on Facebook. I don’t think this one is going to work either. But I do encourage all Trump fans to heed the words of The Donald himself — and get out to vote on November 28th! 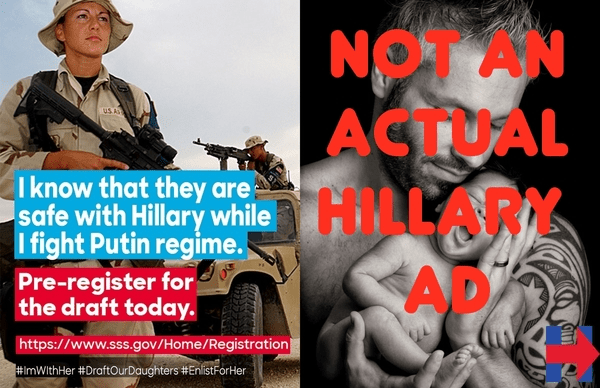 The “I might have to serve in war too”/”maybe in the future” angle doesn’t mesh with the fact that they’re including exhortations to go register for Selective Service now in support of Hillary’s campaign, not after Hillary gets elected. 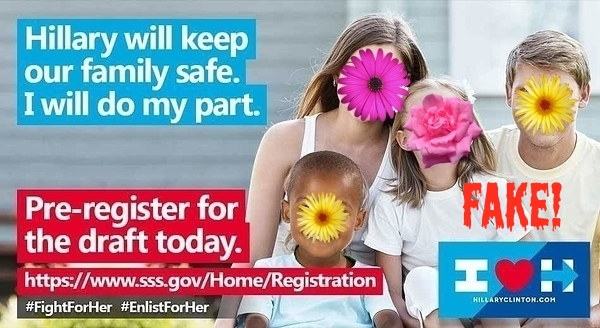 That’s why I’m saying this campaign doesn’t make any sense at all: if they wanted to make the point that women might be required to register, they could have made fake ads attempting to link Hillary to a push to expand SSS requirements. I honestly think they – like a whole lot of people on both sides of the issue – really don’t understand that women are not just exempt from registering, but barred. I’ve seen the argument a number of times, couched in different terms, that if feminists are really interested in equality, not “special rights”, they should register even though they’re “not required”, and pointing out that women are prohibited from registering doesn’t seem to make a difference to them. Then again, no one ever accused the MRM or alt-right of being logically consistent, so I guess there’s really no point in trying to dissect this particular brand of illogic beyond “it’s nonsensical blather poorly designed to harm Hillary voters”, is there? … like they care about their daughters anyway. This made me kind of angry. The Alt-Right are banking on women to back down out of fear. Shows 100% what they think about us. Actually, no, I take that back. I don’t think any of them have thought about this long enough to consider whether or not this fake campaign will actually work, because then they would have realised how cringeworthy it is and how pathetic it makes them look. Ah yes the old chestnut itself, that women can’t be drafted (neither can anyone else when we don’t have another draft) and men can, therefore men are the most oppressed creatures ever, and it proves that society thinks men are worthless instead of being a symptom of a society that thinks women are weak (and that women are commodities). 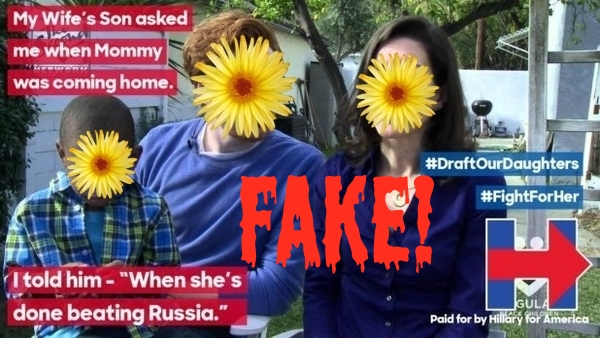 I agree with Christina, and I would add that it shows how scared they are of the draft. Meanwhile, while men’s rights groups have done approximately nothing on their favorite pet issue, to either include women in the draft or stop the draft for themselves (again, what draft?) feminists have taken the issue to the houses of Congress and the Supreme Court multiple times, fighting at the highest levels of law for DECADES to try to get women included. 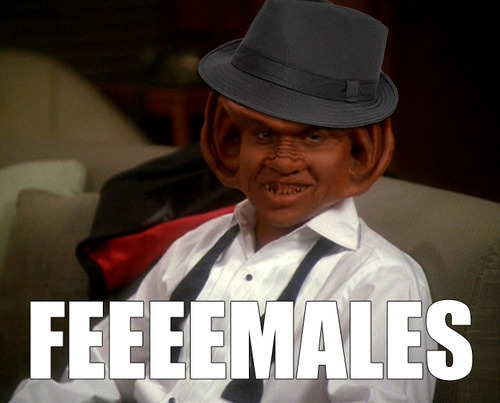 Just recently when some MRA lawmaker tried to (show that women are two-faced hypocritical scaredy cats?) put out a facetious bill about including women in the draft, left-leaning lady lawmakers gave it their full support, and he backed off it himself. 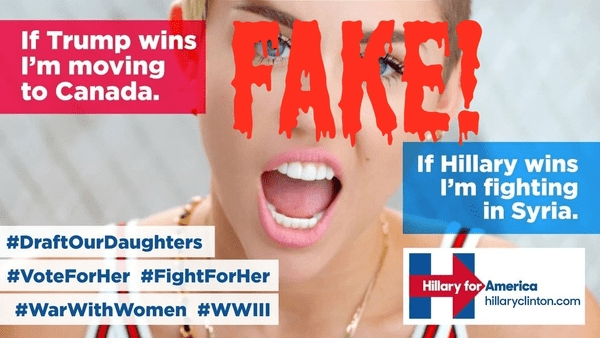 Aside: am I the only one who thought some of those ads were actually a little badass and got more excited about Hillary Clinton being president? These guys seem oddly obsessed with the draft for a group that, I’m assuming, was nearly all born after it was last used. Blame reality for petulantly denying them any evidence of actually being disadvantaged. If only existance wasn’t so biased against them, they wouldn’t have to reach so hard to find proof if it! Admittedly, way back in 88 the Cold War hadn’t been called off and registering was daunting. It just made me think more about what the country was doing in the world. Yes, Princess Elizabeth was an army truck/ambulance driver and mechanic near the end of the war, as part of the Auxiliary Territorial Service. Mostly on her own insistence; her father didn’t want her involved in anything other than training for the throne as the heir apparent, but Elizabeth didn’t want to be seen as a ‘slacker’, and she eventually won the argument. *Giving them massive benefit of the doubt and assuming that these shits actually have anything that could be described as principles. “My wife’s son…” Could they sound any more fake and unsure of themselves when it comes to basic human relationships? I’m pretty sure the “my wife’s son” please is referring to the fact that the child in the photo is black, while both the man and the woman are white. Because all Hillary supporting men are cucks and have been tricked or coerced into raising the children that their wives had with black men. These people are just a matryoshka doll of awful, aren’t they? One day, I’d love to live in Finland. I imagine I wouldn’t be conscripted, but would children I have be? I’d imagine they would, but does anyone know? Seriously, Finland is pretty invested in the whole “Doctrine of Believable Defense” thing, which apparently relies on 75-80% of all boys and men in a generation being part of a militarized reserve. We spend a lot of money on training soldiers we can’t afford to equip with modern weapons. That’s part of the reason why I opted for civilian service (basically community service for the state or some nonprofit), saving the assault rifle for someone who actually wants to take it apart. again in 1941-44 (officially we were not part of World War 2, as admitting that would mean that we were in cahoots with a certain Central European dictator). Now we’re pondering on whether it would be any better (or less necessary) to rely on US against Russia. What do they have to say about someone who calls half the world’s population “disgusting”? Yes, this includes the ones he’d consider hawt because any sign that women have bodily functions really squicks him out. I have a hard time seeing the downside of princess soldiers. Women who were doctors and nurses could always been drafted. Women in the US military have reported serving in active combat but never being paid for it or recognised for it. They are likely to suffer sexual assault while serving. Knowing those things, women have still volunteered to serve. 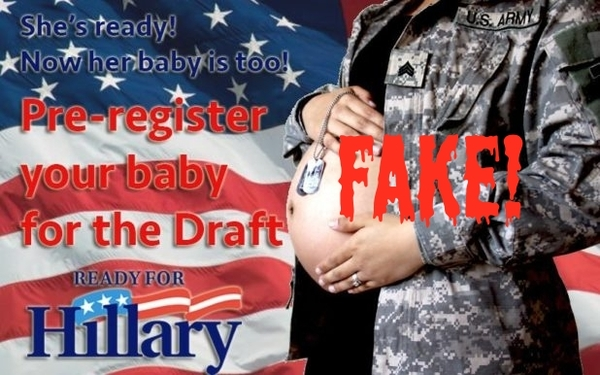 In 2018 women start registering for the draft at age 18, just like men.